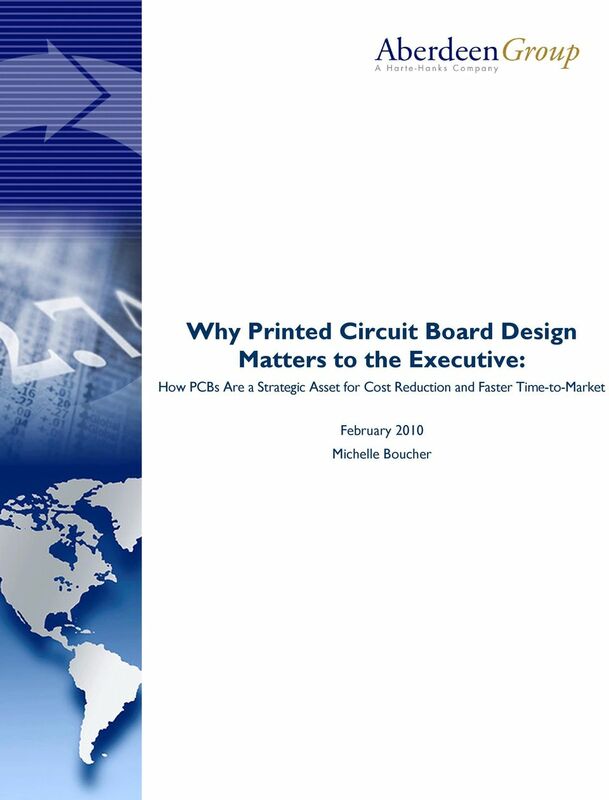 Download "Why Printed Circuit Board Design Matters to the Executive:"
7 Page 7 Class from Industry Average and Laggard organizations. The performance of each of these tiers is displayed in Table 1. 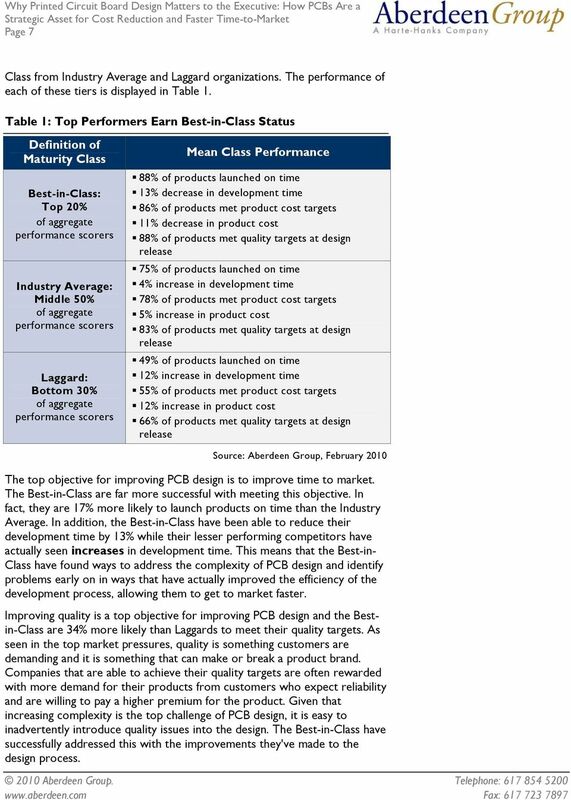 Table 1: Top Performers Earn Best-in-Class Status Definition of Maturity Class Best-in-Class: Top 20% of aggregate performance scorers Industry Average: Middle 50% of aggregate performance scorers Laggard: Bottom 30% of aggregate performance scorers Mean Class Performance 88% of products launched on time 13% decrease in development time 86% of products met product cost targets 11% decrease in product cost 88% of products met quality targets at design release 75% of products launched on time 4% increase in development time 78% of products met product cost targets 5% increase in product cost 83% of products met quality targets at design release 49% of products launched on time 12% increase in development time 55% of products met product cost targets 12% increase in product cost 66% of products met quality targets at design release The top objective for improving PCB design is to improve time to market. The Best-in-Class are far more successful with meeting this objective. In fact, they are 17% more likely to launch products on time than the Industry Average. 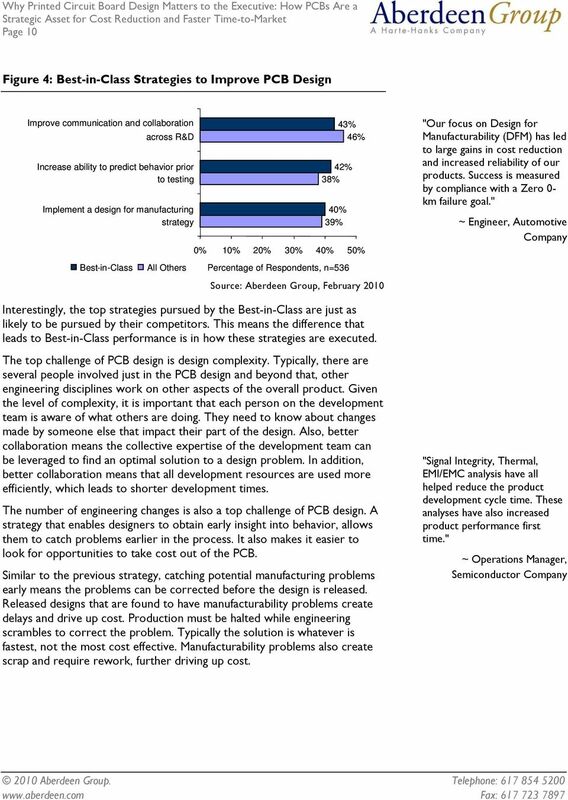 In addition, the Best-in-Class have been able to reduce their development time by 13% while their lesser performing competitors have actually seen increases in development time. 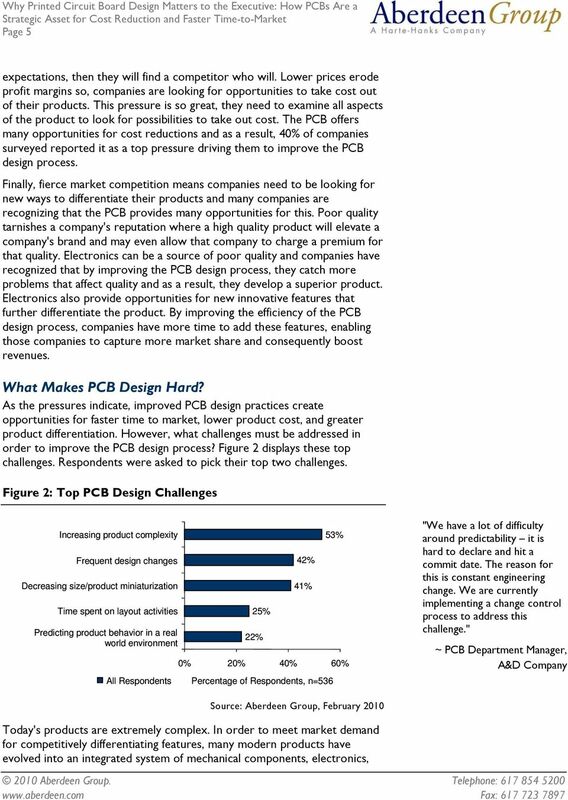 This means that the Best-in- Class have found ways to address the complexity of PCB design and identify problems early on in ways that have actually improved the efficiency of the development process, allowing them to get to market faster. 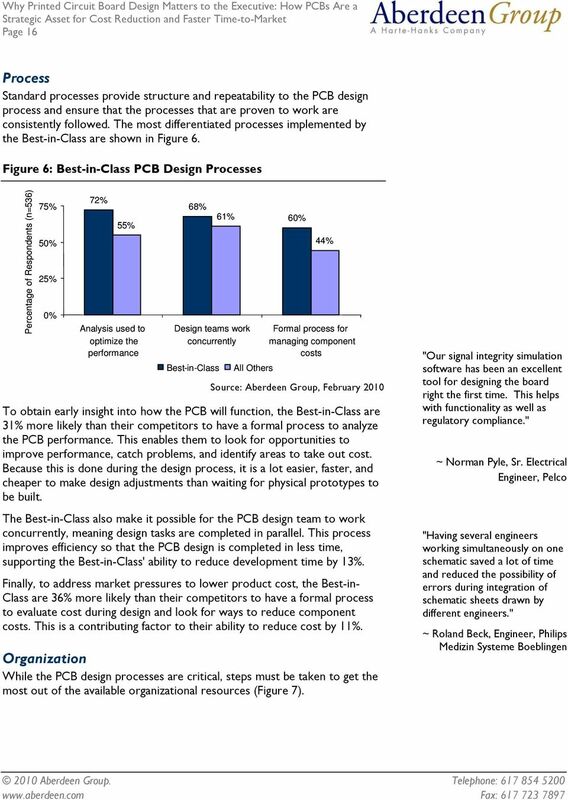 Improving quality is a top objective for improving PCB design and the Bestin-Class are 34% more likely than Laggards to meet their quality targets. As seen in the top market pressures, quality is something customers are demanding and it is something that can make or break a product brand. Companies that are able to achieve their quality targets are often rewarded with more demand for their products from customers who expect reliability and are willing to pay a higher premium for the product. Given that increasing complexity is the top challenge of PCB design, it is easy to inadvertently introduce quality issues into the design. The Best-in-Class have successfully addressed this with the improvements they've made to the design process. 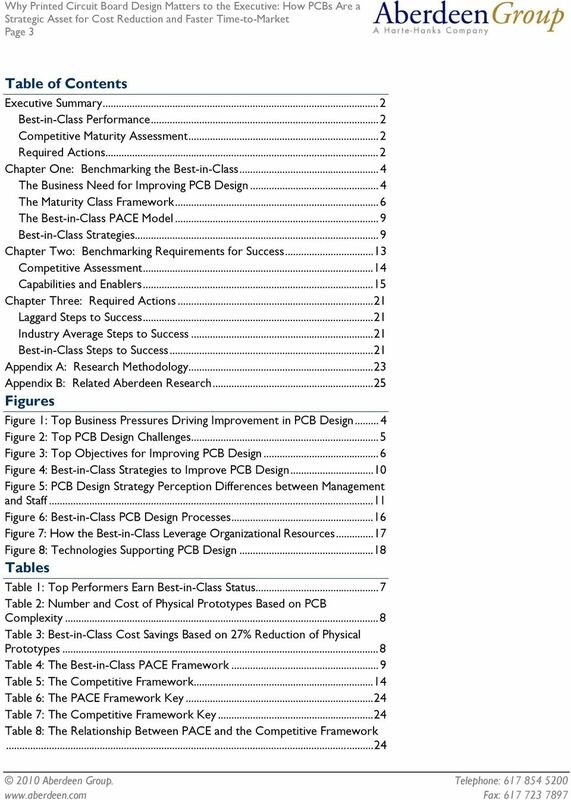 9 Page 9 The Best-in-Class PACE Model Improving PCB design in ways that achieve corporate goals requires a combination of strategic actions, organizational capabilities, and enabling technologies that are summarized in Table 4. 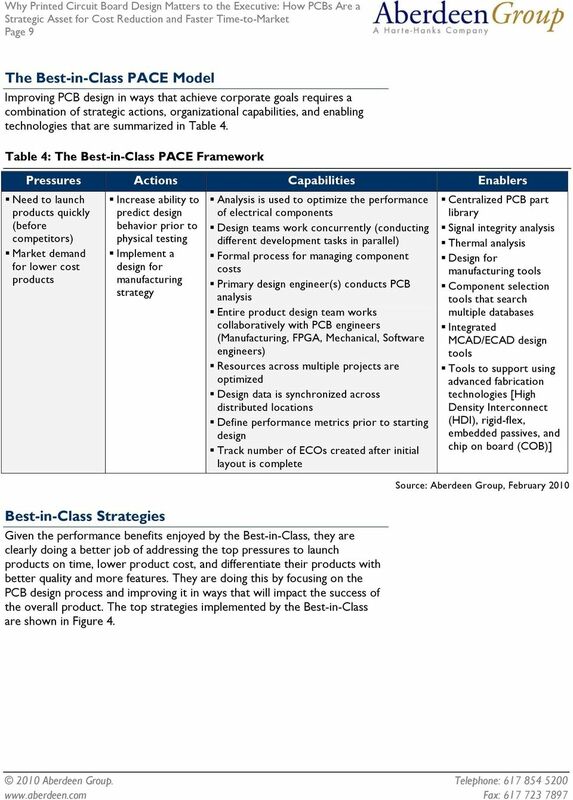 Table 4: The Best-in-Class PACE Framework Pressures Actions Capabilities Enablers Need to launch products quickly (before competitors) Market demand for lower cost products Increase ability to predict design behavior prior to physical testing Implement a design for manufacturing strategy Analysis is used to optimize the performance of electrical components Design teams work concurrently (conducting different development tasks in parallel) Formal process for managing component costs Primary design engineer(s) conducts PCB analysis Entire product design team works collaboratively with PCB engineers (Manufacturing, FPGA, Mechanical, Software engineers) Resources across multiple projects are optimized Design data is synchronized across distributed locations Define performance metrics prior to starting design Track number of ECOs created after initial layout is complete Centralized PCB part library Signal integrity analysis Thermal analysis Design for manufacturing tools Component selection tools that search multiple databases Integrated MCAD/ECAD design tools Tools to support using advanced fabrication technologies [High Density Interconnect (HDI), rigid-flex, embedded passives, and chip on board (COB)] Best-in-Class Strategies Given the performance benefits enjoyed by the Best-in-Class, they are clearly doing a better job of addressing the top pressures to launch products on time, lower product cost, and differentiate their products with better quality and more features. 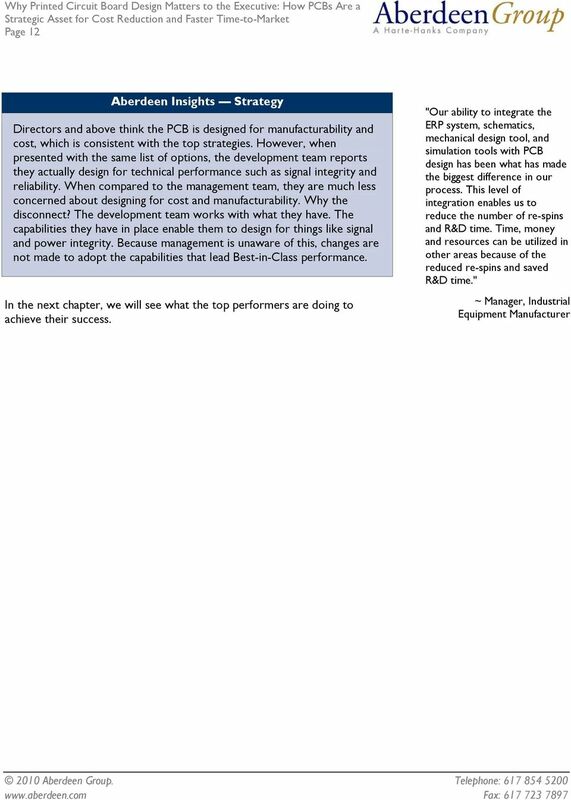 They are doing this by focusing on the PCB design process and improving it in ways that will impact the success of the overall product. 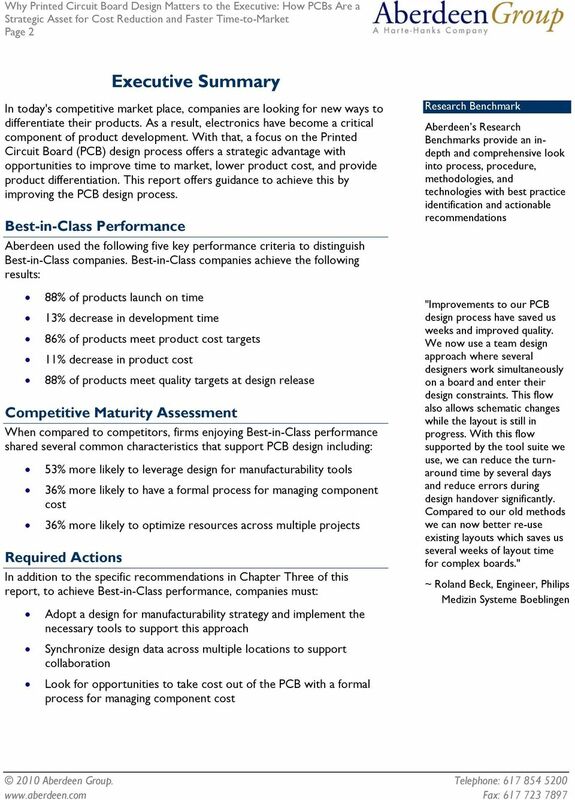 The top strategies implemented by the Best-in-Class are shown in Figure 4. 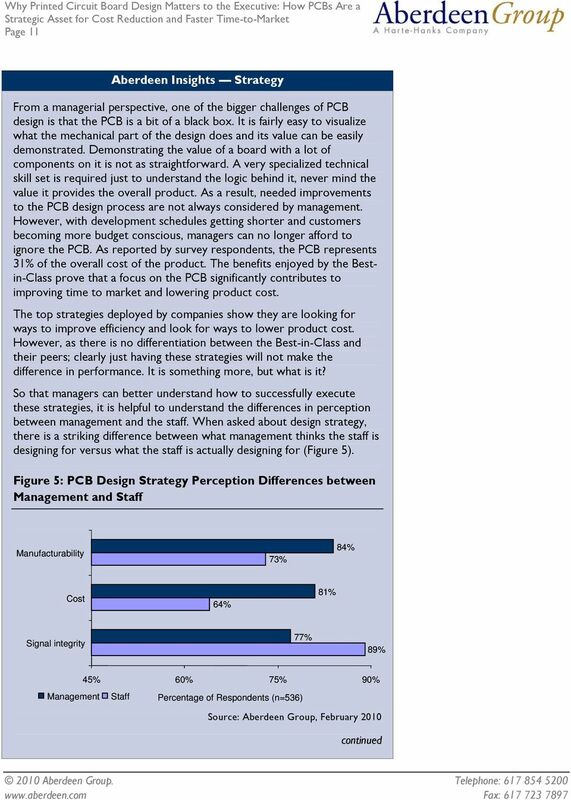 17 Page 17 Figure 7: How the Best-in-Class Leverage Organizational Resources Percentage of Respondents (n=536) 75% 50% 25% 0% 69% 68% 61% 58% Primary design Extended development engineer(s) conducts team collaborates with PCB analysis PCB engineers 61% 45% Resources across multiple projects are optimized Best-in-Class All Others The Best-in-Class have a process in place to analyze PCB performance during the design process. To support this, the primary design engineers are responsible for conducting this analysis. This means they can leverage the analysis results to make better design decisions as they design. This is more efficient than handing the design over to an Analyst expert every time an analysis needs to be conducted. The end result is the design engineer is more likely to make educated design decisions that improve quality and lower product cost. 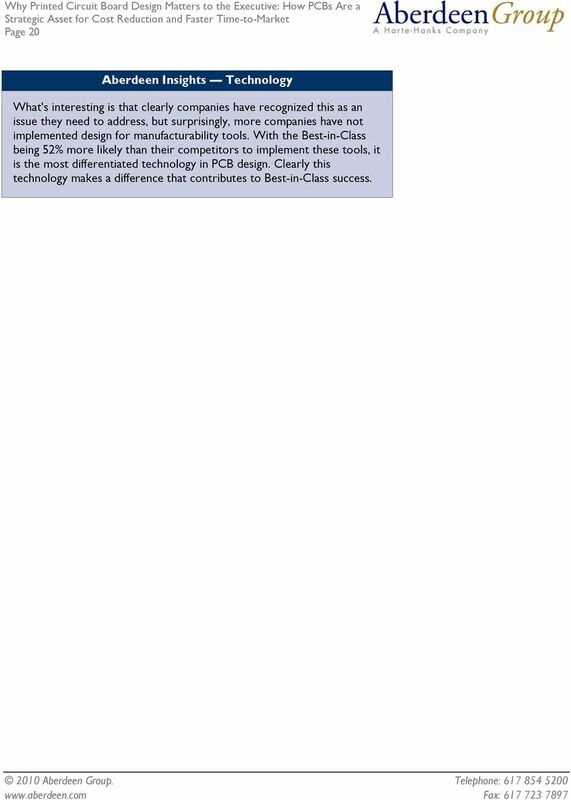 The Best-in-Class have a process in place so that the PCB design tasks are conducted in parallel. 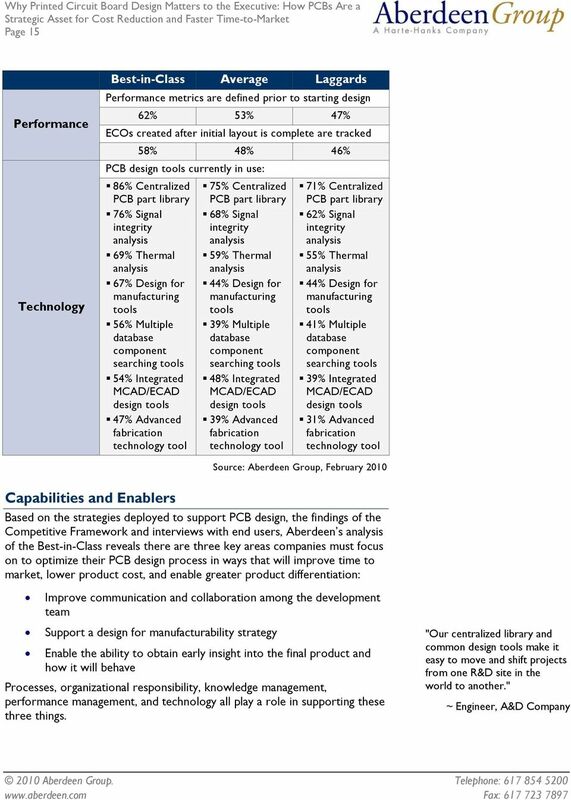 To support further collaboration, they support an organizational structure to enable those outside of the PCB design team (such as manufacturing, mechanical, and software engineers) to collaborate with the PCB engineers. This supports a design for manufacturability strategy as well as helps to avoid problems due to incompatibilities between different design aspects of the overall product. 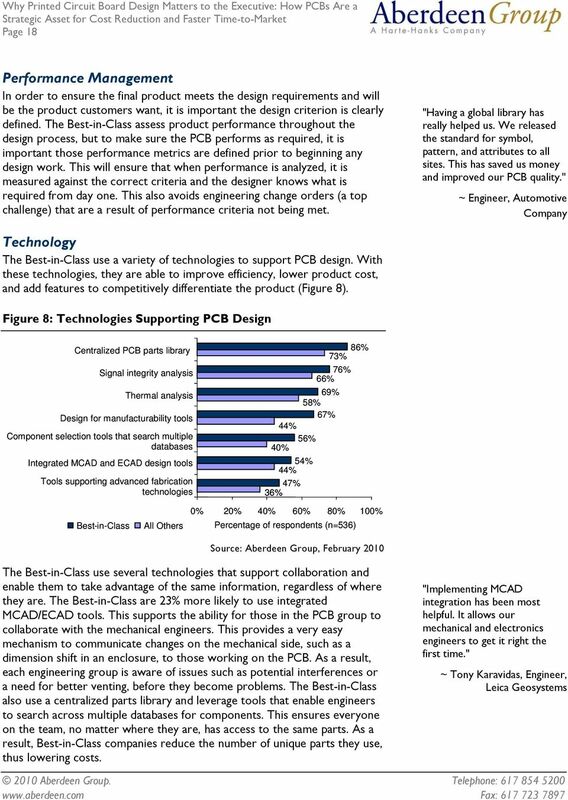 Finally, the Best-in-Class are 36% more likely to make sure they leverage their PCB design resources across multiple projects. This ensures optimal efficiency which results in shorter development time. 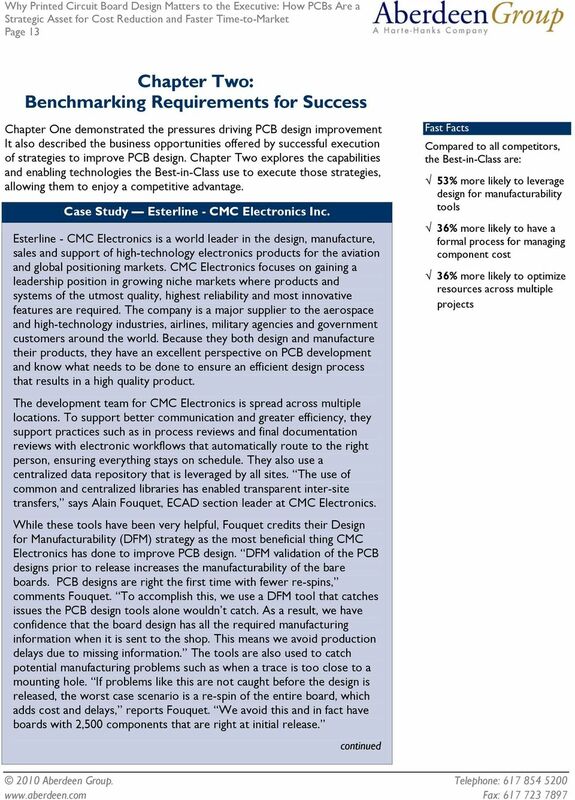 "A team oriented approach to PCB design has improved communication and reduced design times." 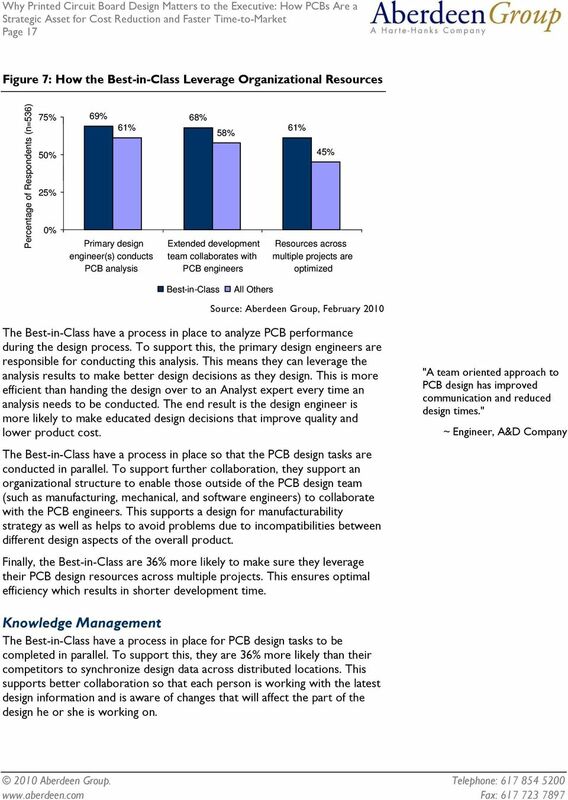 ~ Engineer, A&D Company Knowledge Management The Best-in-Class have a process in place for PCB design tasks to be completed in parallel. To support this, they are 36% more likely than their competitors to synchronize design data across distributed locations. This supports better collaboration so that each person is working with the latest design information and is aware of changes that will affect the part of the design he or she is working on. 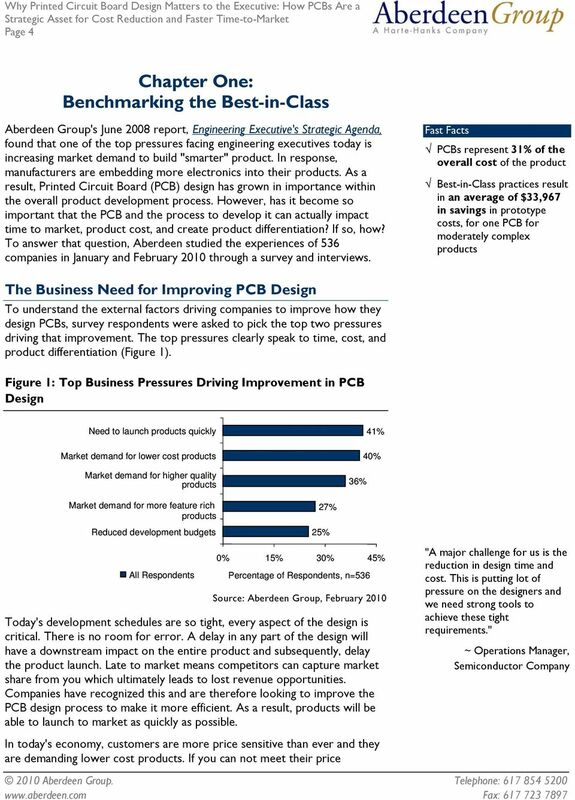 20 Page 20 Aberdeen Insights Technology What's interesting is that clearly companies have recognized this as an issue they need to address, but surprisingly, more companies have not implemented design for manufacturability tools. 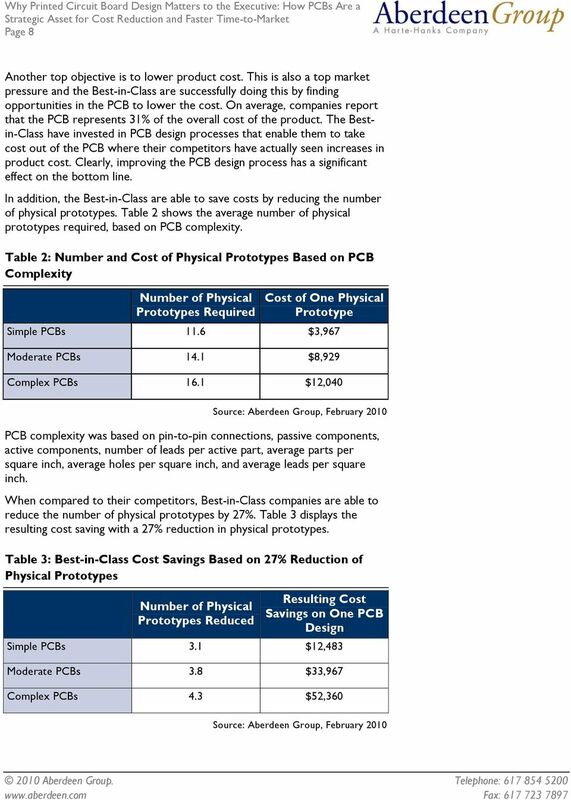 With the Best-in-Class being 52% more likely than their competitors to implement these tools, it is the most differentiated technology in PCB design. Clearly this technology makes a difference that contributes to Best-in-Class success. 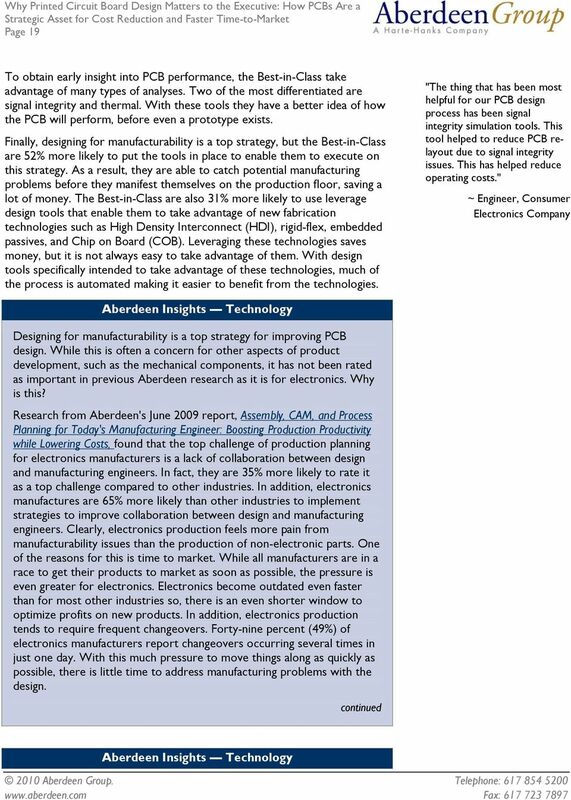 23 Page 23 Appendix A: Research Methodology Between January and February 2010, Aberdeen examined the use, the experiences, and the intentions of 536 enterprises in a diverse set of industries. Aberdeen supplemented this online survey effort with interviews with select survey respondents, gathering additional information on their strategies, experiences, and results. Responding enterprises included the following: Job title: The research sample included respondents with the following job titles: Executive level manager (4%); VP/Director (5%); Manager (17%); Engineers (70%); and other (4%). Industry: The research sample included respondents from a wide cross section of industries. The sectors that saw the largest representation in the sample were: aerospace and defense (26%), consumer electronics (21%), telecommunications (19%), automotive (14%), medical devices (10%), and industrial equipment (8%). Geography: The majority of respondents (57%) were from North America. Remaining respondents were from Europe (24%), the Asia / Pacific region (16%), and from the rest of the world (3%). Company size: Forty-four percent (44%) of respondents were from large enterprises (annual revenues above US $1 billion); 37% were from midsize enterprises (annual revenues between $50 million and $1 billion); and 19% of respondents were from small businesses (annual revenues of $50 million or less). Headcount: Sixteen percent (16%) of respondents were from small enterprises (headcount between 1 and 99 employees); 28% were from midsize enterprises (headcount between 100 and 999 employees); and 56% of respondents were from large businesses (headcount greater than 1,000 employees). 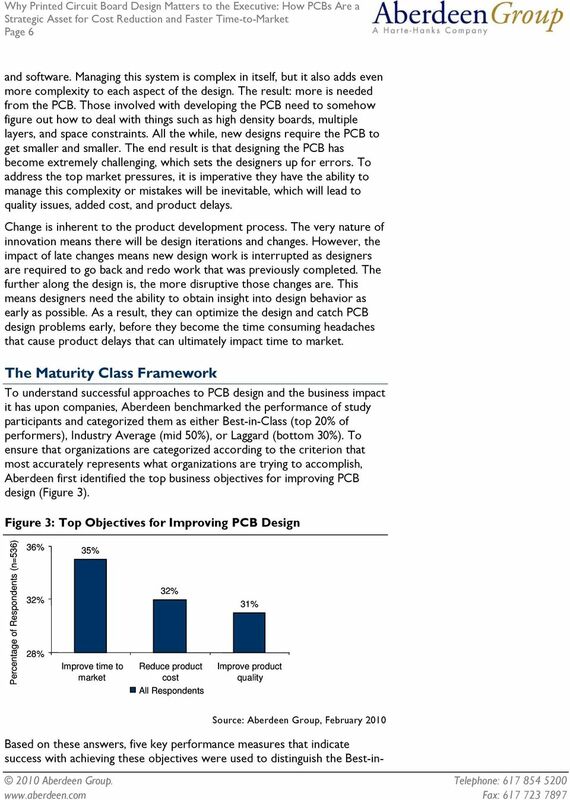 Study Focus Respondents completed an online survey that included questions designed to determine the following: What is driving companies to improve PCB design The challenges of PCB design The actions these companies are taking to improve PCB design The capabilities and technology enablers they have in place to support PCB design The study identifies emerging best practices to support PCB design and to provide a framework by which readers could assess their own capabilities. 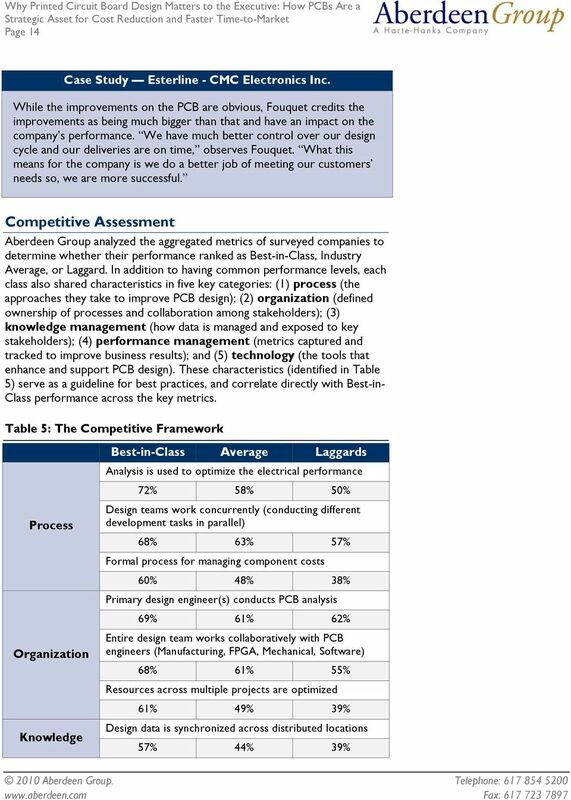 24 Page 24 Table 6: The PACE Framework Key Overview Aberdeen applies a methodology to benchmark research that evaluates the business pressures, actions, capabilities, and enablers (PACE) that indicate corporate behavior in specific business processes. These terms are defined as follows: Pressures external forces that impact an organization s market position, competitiveness, or business operations (e.g., economic, political and regulatory, technology, changing customer preferences, competitive) Actions the strategic approaches that an organization takes in response to industry pressures (e.g., align the corporate business model to leverage industry opportunities, such as product / service strategy, target markets, financial strategy, go-to-market, and sales strategy) Capabilities the business process competencies required to execute corporate strategy (e.g., skilled people, brand, market positioning, viable products / services, ecosystem partners, financing) Enablers the key functionality of technology solutions required to support the organization s enabling business practices (e.g., development platform, applications, network connectivity, user interface, training and support, partner interfaces, data cleansing, and management) Table 7: The Competitive Framework Key Overview The Aberdeen Competitive Framework defines enterprises as falling into one of the following three levels of practices and performance: Best-in-Class (20%) Practices that are the best currently being employed and are significantly superior to the Industry Average, and result in the top industry performance. Industry Average (50%) Practices that represent the average or norm, and result in average industry performance. Laggards (30%) Practices that are significantly behind the average of the industry, and result in below average performance. In the following categories: Process What is the scope of process standardization? What is the efficiency and effectiveness of this process? Organization How is your company currently organized to manage and optimize this particular process? Knowledge What visibility do you have into key data and intelligence required to manage this process? Technology What level of automation have you used to support this process? How is this automation integrated and aligned? Performance What do you measure? How frequently? What s your actual performance? Table 8: The Relationship Between PACE and the Competitive Framework PACE and the Competitive Framework How They Interact Aberdeen research indicates that companies that identify the most influential pressures and take the most transformational and effective actions are most likely to achieve superior performance. The level of competitive performance that a company achieves is strongly determined by the PACE choices that they make and how well they execute those decisions.